When you think about it, there's more than one use for the pumpkin. You can carve it to use for decoration or you can cook it and eat it. While you can go to a local grocery store and purchase a pumpkin, part of the fun is heading to a farm or patch to find your very own. Florida has a rash of farms and other sites where you can do that, often at no cost (except to buy the pumpkin). A few tips: Look for a pumpkin that is entirely orange colored. Partially green pumpkins might not ripen any more. When it comes to size, medium pumpkins tend to be best for carving, while the smaller ones are better for cooking. With that in mind, these are the times (Halloween nearly here) when you think about more than just goblins and ghosts. 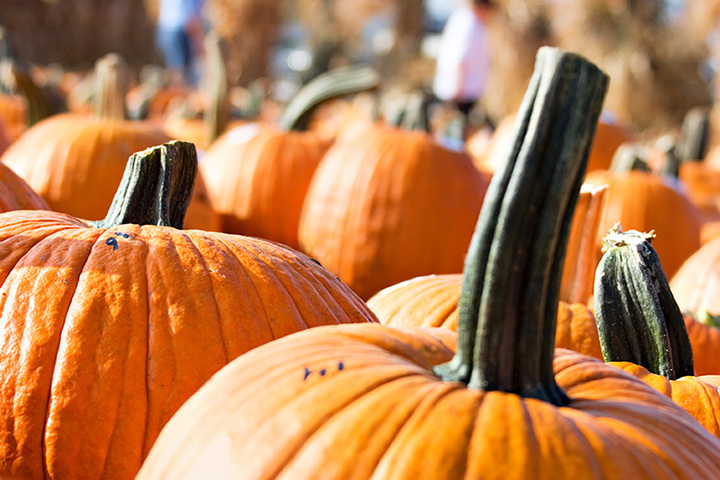 Let's get into the top pumpkin picking spots in Florida. The real thing is always popular. And that's what you get here. Pumpkin growing, as the farmers here will tell you, is not particularly amenable to Florida's hot climate. But a group of Christian-oriented brothers who grew watermelons (more amenable in Florida's climate) several years ago found ways to compensate. The result is great October pumpkin picking for the entire family. There's also hayrides, a corn maze, a hay fort and slides for children. In addition to pumpkins, you can pick sunflowers. There is an admission fee of $5 for adults, but children three and under are free. This is one place to be if you want more than pumpkins. Painted Oaks' yearly festival includes pumpkins and ponies. There are hay rides, food, music, petting zoo and local vendors. And also, of course, pony rides. The story of how this all came about is worth retelling. David Ottersen was a long-time horse-lover as well as his wife, Lisa Hall. Ottersen worked as a realtor/mortgage broker. By chance, he came across an equestrian center for sale. He immediately drove the 10 miles to the site. He decided impulsively to buy it. Lisa also immediately fell in love with it. They changed careers. You might say they couldn't say "neigh." They have operated it as a working horse ranch for several years, known for their specialty of offering riding pony lessons to children. Special events such as the pumpkin patch have also cropped up in recent years. This farm has been holding its pumpkin festival for over 30 years. But events there also include a variety of family activities: pony rides, a rock wall and bounce house. And in October, pumpkin painting. Each venue has their own set price, ranging from $2 to $7, but admission and parking is free along with the petting zoo, playground, live music and decorated photo locations. The store is not free, of course, but it offers certified and non-certified organic farm fresh citrus and produce that is grown locally. Jams, jellies, honey and hand-dipped ice cream are also favorites. And pumpkin ice cream is sold year-round. Not everyone likes chains, but this one came to South Florida more than a decade ago and has been so popular it now has three South Florida locations. Not entirely a surprise because it caters to families who have made it part of their holiday traditions. Families have seriously adopted its suggestion that pumpkins are not just about picking your own but also about "embracing the fall spirit." It helps do that by adding amenities for kids such as bounce houses, hay bales to climb to new heights, head cutout photo ops, and a merry-go-round. The lots also sell pumpkin carving kits, pumpkin carving saws and even books on the subject. The three lots are open Oct. 9 through Halloween. Hours are generous: 9 a.m. to 9 p.m, seven days a week. Admission is free and pumpkins are priced by the pound. One bargain area: mini pumpkins at less than a dollar each. Most people only have a vague idea of how hydroponic growing differs from soil planting. Hydroponic means growing in water, and has many advantages including ecological. It saves land and allows crops to grow in areas where the soil is too poor, among other benefits. You can learn a lot here about it all year long, but particularly in October when its pumpkin patch is open every day. There's fun elements as well with free admission (costumes welcome), games and crafts. The farm sells not only pumpkins but also hay bales, corn stalks and other decorations for community, school and other events. "Bring the kids, bring the dog, heck, bring grandma. It's free," the site says. An offer that is hard to refuse. This family-run farm calls itself "the nuttiest place around." And that sure is accurate because they started as a peanut farm before adding other events such as pumpkins, making themselves one of the few area places for pumpkins. Owner Bruce Holland began farming while in high school during the early 1970s. His family has had the farm for more than a century. Holland Farms boils peanuts for local high school band boosters, quarterback clubs and raceways. Today, they're one of the only pumpkin patches where you can pick your own pumpkin. The pumpkins are cut from the vine so you know which ones are ripe enough to pick but are in their original growing place. Activities include a "spider web," sand box, swings, horse tire swings, pedal tractor cart racing, slides, petting zoo, corn box, zip lines and a maze. Admission prices can be as much as $12 for adults, but that includes a pumpkin, hayride and all other activities. If you want to save money, you can get in for $8 but have to pay more for your pumpkin. But their open season is longer than most, lasting till Nov. 3. Ask for a free cup of boiled peanuts. They call it "pumpkins with a purpose." Several years ago a church member came up with the idea to start a pumpkin patch in the open field on this Methodist Church property. The idea was to encourage family fun, and also help financially support the church. It's turned into one of the best patches in the area, where some of the freshest pumpkins are offered. Events include craft fairs, face painting, bounce houses, and a "trunk-or-treat" day - candy offered from car trunks. Admission is free and pumpkins are sold by donation. It's open daily through the end of October. If you happen to live in the area and the spirit moves you, volunteers for the event are always welcome. Not so "little" when you consider it draws people from heavily populated Dade County, which includes Miami, as well as Broward County, which is home to Fort Lauderdale, and also the Florida Keys and Key Largo. Family activities have been the major reason since 1978. Pumpkins aside, visitors can accompany employees on actual farm feeding. help feed the animals, and even milk the cows. The farm also features animals such as goats, sheep, piglets, geese, ducks, turkeys and others. Don't miss the loveable three-foot-high pony that is always a treat to see. For adults (kids, too), there's a butterfly garden. There's no per person entry fee but there is a $5 parking cost. Children and adults, too, have long been fascinated with the up close animal encounters. If you buy a pumpkin, which range in price from $7 to $30, you get a free pony ride.